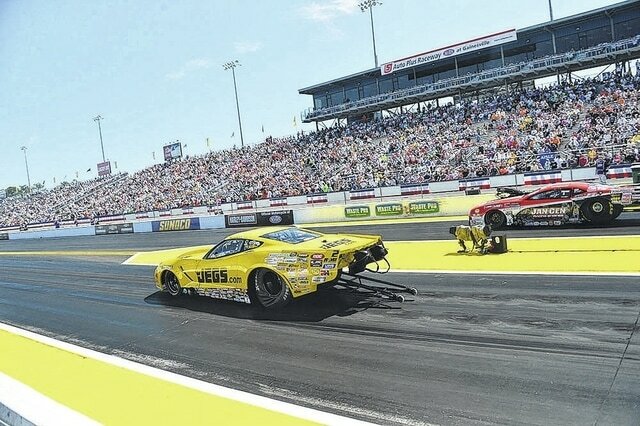 Pro Mod drivers Troy Coughlin and his son Troy Coughlin Jr. will compete at this weekend’s J&A Service Pro Mod Drag Racing Series event at Bill Bader’s strip in Norwalk. Pro Mod drivers Troy Coughlin and his son Troy Coughlin Jr. are extra revved up for this weekend’s J&A Service Pro Mod Drag Racing Series event as it takes place in their home state of Ohio and Bill Bader’s awesome strip in Norwalk. “It’s always fun to race at home because you see a lot of the people you raced with growing up,” Troy said. “I’ve been lucky enough to race for many years in a lot of different categories so us old timers can reminisce about the good ol’ days. T.J. will see a bunch of his buddies he raced Junior Dragsters and in the sportsman ranks. It should be a good time for both of us. Mike and Troy made a little family history last year by doubling up and winning their respective classes at this event, something Troy would love to repeat this time through. “It was pretty awesome,” Troy said. “Mikey is going to be there racing with us again this year, and T.J.’s going to be racing Super Comp and Pro Mod, so it should be a lot of fun. We’ll have a lot of family there and hopefully a lot of the associates from JEGS.com will be there scoping out the races. Troy and Troy Jr. enter the Norwalk event ranked fourth and seventh, respectively, in the Pro Mod points standings. Troy is 44 points behind leader Don Walsh, while Troy Jr. is 119 points out of the lead. In addition to his Pro Mod duties, Troy Jr. will be driving his Super Comp dragster to get some extra seat time. “The great state of Ohio is home for us, and Norwalk is a great place and somewhere that offers a very comforting atmosphere for me,” Troy Jr. said. “It’s a big confidence booster just knowing you’re home and all your friends and family will be there rooting for you. “I’m going to run a little 8.90, along with Pro Mod, so I’ll be having twice as much fun. I really enjoy 8.90 racing – it’s my first love and a class where I’ve won a lot, so I’m excited. It’ll probably loosen my mind up a little bit, which will be nice. The Pro Mod class will hold three qualifying sessions at 4:15 and 7 p.m., today, as well as 4:15 p.m., Saturday. Eliminations begin with a solo round at 7 p.m., Saturday, followed by the final three rounds beginning at 12:45 p.m., Sunday.